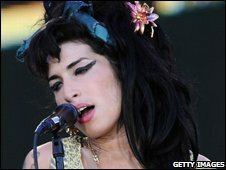 Singer Amy Winehouse could suffer a "slow and painful death" from lung disease emphysema, her father has said. Mitch Winehouse told Sky News she had "a small amount of emphysema in the top of one of her lungs" but it could become "a lot more serious." "I want people to understand - even if they give her one cigarette, they're causing her harm," he said. He added that Winehouse would stop performing live shows "for the foreseeable future". "From 6 September, we're not going to be doing any more work," he said. "She has five contractual gigs between now and then that she has to do. Then she will be relaxing and writing." Winehouse, 24, was admitted to hospital in June after collapsing at her north London home. Her father said she had developed emphysema from smoking cigarettes and crack cocaine, but was now taking steps to "check her behaviour". "My biggest fear is that she would die," he said, "but she won't die of a drug overdose. "It won't be that quick. "She would die, unfortunately, of emphysema... We would be talking about a very slow and painful death, gasping for air." "I would ask any people who would supply her with substances to think on that," he added. Winehouse was discharged from hospital in time to perform at a special birthday concert for former South African leader Nelson Mandela and the Glastonbury festival, but she has continued to act erratically.